Are you looking for the latest forecast of Somo? Have you ever had that feeling of not knowing if there are waves or not? Do not you feel restless when you are at home, at work, in class and you wonder how the sea will be? If there will be a bathroom at that moment? Do not be alarmed, it happens to all the surfers. It is one of the things that differentiate us from other sports: our playing field is dynamic, changing and unpredictable. It is now possible, with the inherited knowledge, and the current technologies to know how will be the forecast of waves in Somo. It’s going to make the difference between having an epic session fit you, or failing and not enjoying yourself. – Wave height: Somo beach is a magnet for waves, a place with waves practically all year round. Our level will be the one that marks until the size of the wave we can surf. Small waves will be able to surf all the levels, and more advanced levels will be the ones trained for higher waves. – Direction of the waves: a wave of northwest direction is not the same, that west, that northeast. The disposition of the bay of Santander with respect to Somo makes each swell interact in a way. The luck is that the beach of Somo works with many directions of sea, being his favorite the waves of northwest direction. – Period: this data is an indicator with a lot of information. Summing up and without going into many technicalities, the period is the time between wave and wave. In general, the longer period, the better the quality of the waves. It works with a very large range of periods. As an example, a wave of 10-12 seconds of period between waves has the potential to result in a good day of waves. – Wind: the wind that we have on the beach will be fundamental. A good state of the sea, with an inadequate wind, will break the session. On all beaches, strong sea winds are the least favorable, the soft winds are the most suitable. Something magical happens on Somo Beach. Being a beach of 7 kilometers long, and having that special curvature, winds of west orientation work towards the westernmost zone, sures winds are perfect in all the beach, and with east wind, the easternmost zone will be the most suitable . We already know some websites where we can see the weather forecast in Somo. But do we really know how to interpret and read a part of waves? 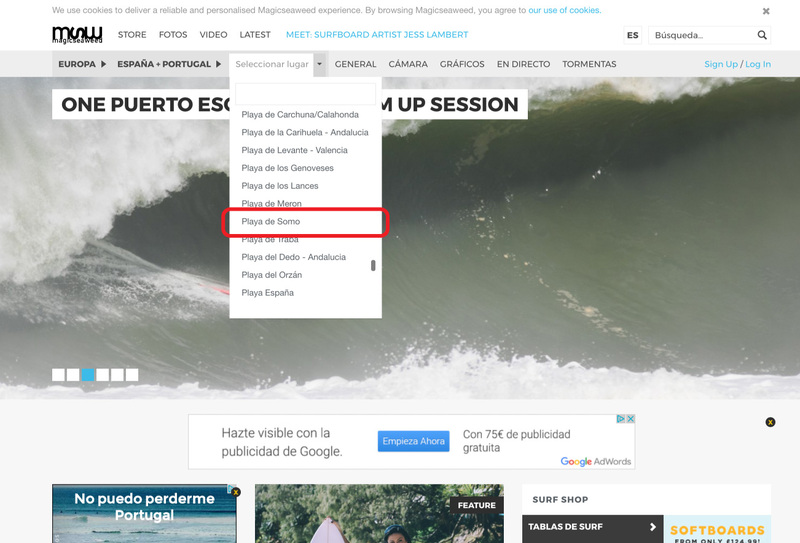 We will use as an example the magicseaweedsomo page and the predictions for Somo Beach, where the Cantabra Surf School is located since 1991. Charts, arrows, numbers, stars … and much more, appears on the page. We are going to shape it and try to simplify it. 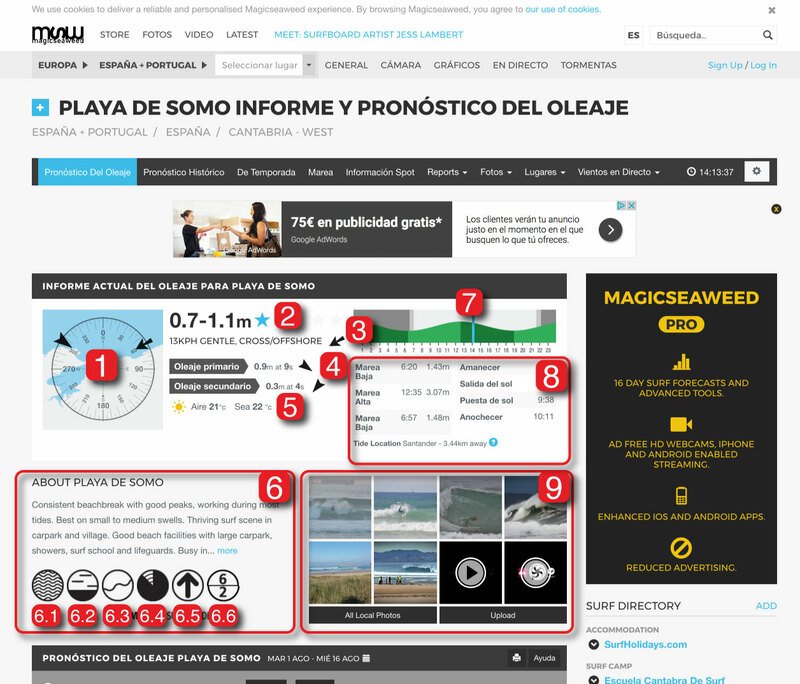 Once we entered the page, magicseaweed.com, the first thing we should know, is in which area we want to surf. Just choose the beach of Somo, the main page of our spot will be charged. 1- Map of the area with direction of wind and waves: this small map shows an aerial image of the area, placing as center Somo and around a circle with all the possible angles from 0º to 360º. There are two black arrows, one marking the direction of the waves and another the direction of the wind. 2- Range of swell height and score: from a first glance we can see the range of expected size and a score given by the page itself depending on the rest of the parameters, in blue stars, maximum 5. 4- Direction and size of the waves: it indicates the size, period in seconds (time between waves, the more period, in general, it is a more orderly swell, of higher quality), and direction with an arrow, of the “primary waves” or main. Several waves of different places with different characteristics arrive at the beach. 5- Ambient and water temperature: another data that we offer is the ambient temperature, and that of the water, very important this last one for the election of the appropriate neoprene. 6- General information about the beach of Somo: it describes in a summarized way the characteristics of our beach. 6.1- Type of tide: Somo beach is a marvel for surfing, it works on all tides. 6.2- Break type: our beach is a beach break with multiple peaks, 7 kilometers of perfect beach for all levels. 6.3- Type of background: Somo is a sandy bottom beach. 6.5- Ideal direction of the wind: here it indicates that the optimal wind for Somo, being a beach facing north, is the south, perfect offshore wind. 6.6- Ideal wave size: Somo works with a very wide range of sizes, which is why it is one of the beaches with the most wave days in Spain. From just under half a meter to almost two meters, Somo has waves for any surfer. 7- Graph with the tides: with this representation we see the variations of the high tides and low tides throughout the day. In the Somo beach we find 4 daily tides, two high and two low, alternating a high and a low, every 6 hours between them. 8- Tide, sunrise and sunset, sunrise and sunset times: important data to plan our session, hit the tide and take advantage of the hours of the day. 9- Photos and videos: section where we can enjoy visual content of the beach in particular. If we continue down the page, we find a graph that tells us in a quick glance the size of the waves during the next days. If we put the cursor along the graph, it will indicate at that moment where we stand, what wave size range, strength and direction of the wind, size, period and direction of the swell will be. 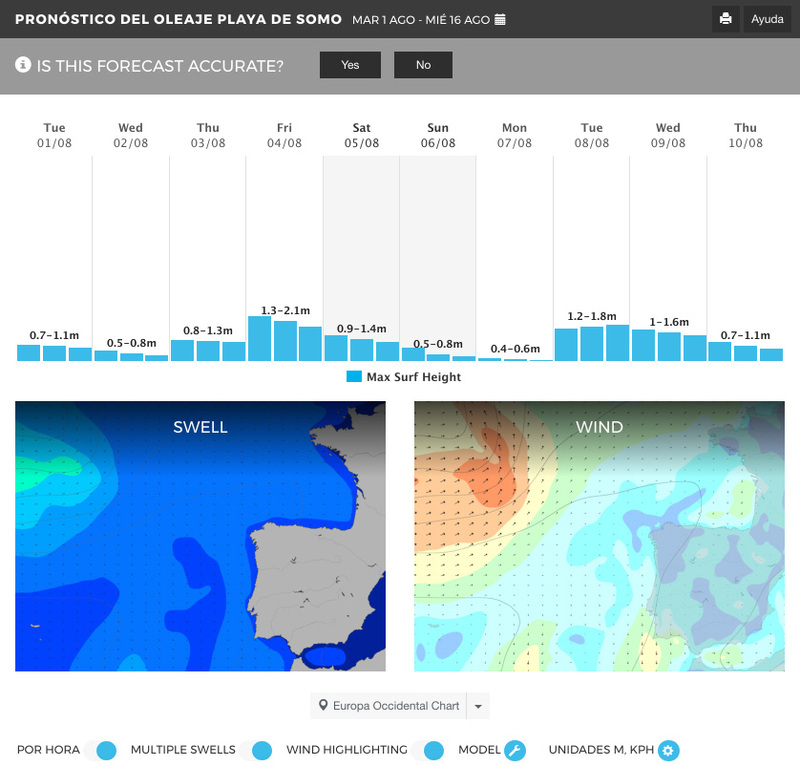 In addition, to complete that information while moving the cursor over the days, there are two maps below that interactively indicate the waves in size and direction (right, with clearer colors and larger waves) and strength and direction and wind (darker colors plus strength) Thus we can observe the evolution of the waves and the wind throughout the days. Just below, that information is captured for days. It is possibly the part of the page most consulted. If we want to expand all of the above and have a more precise knowledge of the day we are going to surf, by clicking on that specific day, all the information of that day is displayed: wave range, score, height, period and direction of the waves ( primary, secondary …) wind speed and direction, and meteorological information. Below, we will observe the tide graph throughout the day, and the data of high and low tide, sunrise, sunset, sunrise and sunset. We already have everything, we already know when to go to the beach, we have prepared the table and the suit! But often it happens, that the parties mark us of an epic session, and when arriving at the beach, the thing changes … it is not what was expected … the wind is different, the waves do not break well … or just the opposite, one day you decide not to surf, you looked at the part and it did not seem appetizing … and suddenly a picture on Facebook, a whatsapp message, someone who has bathed … is what we could call the factor X: our environment is partly unpredictable and variable, it depends on the conjunction of so many factors that it is often impossible to know what will be the result of everyone’s interaction … whether the conditions will be good or not for surfing. As surfers we live with that constant restlessness of search, of uncertainty. Our advice is that you go to the beach whenever you can or check the conditions through our web cam and be good or regular, you go to the water: a bathroom is a bathroom, and everything counts.